I thought, for my 100th post, I would do something a little special. No recipe, no reviews - more of a list. I've learned a lot of things about food, cooking, writing, restaurants, and most importantly, myself in the two years since I've started The Community Plate. I've done things over the past few years that I never thought I would be able to do. I never thought I'd be able to make queso dip that tastes exactly like the queso from my favorite Mexican restaurant. I didn't think I would ever begin to learn how to take pictures of my food and actually have them look presentable. I didn't think one of my readers would be the news blog, Baltimore News Journal. However, I still have a lot of things left I'd like to do. Dedicated to my 100th post, here is a list of 50 cooking goals I've set for myself for the next 100 posts... and the other 50? That's where you come in - together, let's hit 100 cooking goals for next year! Leave your special cooking goals in the comment section! 5. Host a big holiday dinner at my own house: Thanksgiving, Christmas, Easter, etc. 15. Learn about food from other cultures besides Mediterranean and Mexican - i.e. Indian, Asian, French, etc. 20. Use different proteins: duck, Cornish hens, venison, lamb, etc. 24. Learn to go easier on the cheese - I love it. Not everyone does. 30. Make homemade soft pretzels! 35. Really delve into my analytics for my page, find out who's visiting, when, why, etc. 36. Incorporate more fruit in my cooking - even though I don't like fruit in my food, doesn't mean my readers don't! 40. Attempt to have one day per week be "meatless"
41. Try more diet-restriction foods: gluten-free, vegan, vegetarian, etc. 48. Use flavors I haven't used before: turmeric, curry, za'atar, chiles, cloves, etc. 49. Learn to "read" food more: i.e. not having to use a meat thermometer, not having to cut certain things open to check if they're done, etc. 50. Blog more!! Set a goal of three posts a week, with at least 10/month. Learn more about what my readers want to read, eat, and see. Involve my readers more. Keep going forward! 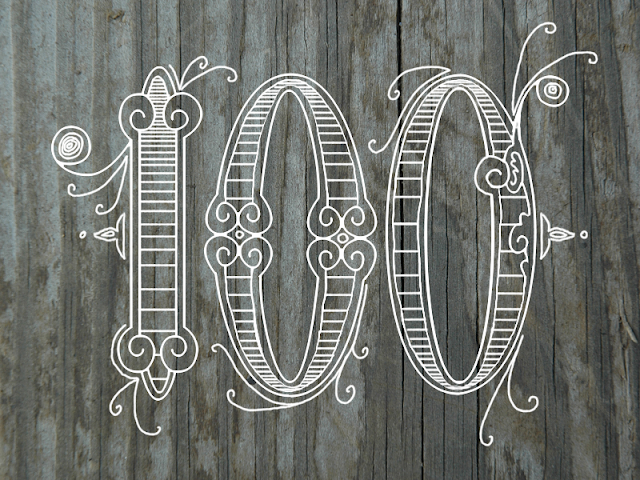 Congrats on 100 posts! I remember when you first started, I hoped that you would stick with it. And I have to say that over the last 2 1/2 years, I'm so proud about what this blog has become! Plus, I love bragging to people that my best friend has a food blog (especially that amazing feature by yours truly). I think the 50 goals you set are spot on! I also better be invited to # 5. My own personal cooking goal is to use my awesome hot dog machine won in Maryland - no I have not used it yet. I would love to see some posts dedicated to your own family recipes. Specifically stuffed olives, supersod (spelling? ), the perfect Nonna meatball, etc. You know, basically all of my favorites - so that then I can cook them at my house and feel like I'm at your house. Keep up the good work! I love you!! !